SAGU and members of the Waxahachie Lions Club donate 70 computers for individuals who struggle with partial sight, low vision, legal blindness and total blindness. 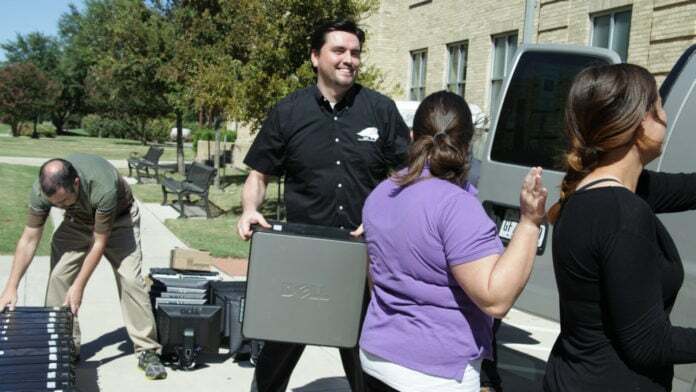 WAXAHACHIE—Southwestern Assemblies of God University (SAGU) in collaboration with the Waxahachie Lions Club, recently donated 70 computers to Computers for the Blind. Computers for the Blind (CFTB) is a national non-profit organization with a mission to provide computers that are compatible with individuals who struggle with partial sight, low vision, legal blindness and total blindness. David Jeppson, Executive Director of CFTB, said that the goal is to open up the world of technology to the visually challenged. The process all started in December of 2015 when Jeppson spoke at a Waxahachie Lions Club meeting on behalf of CFTB. Lions Club is an international service club organization devoted to social and community service with members that are usually associated with business and professional groups within the club’s community. Mark Walker, Director of Campus Software and member of the Waxahachie Lions Club, realized during this meeting that this could be an opportunity for SAGU to get involved. According to Walker, SAGU tries to replace computers every few years to stay up-to-date and maintain quality performance. Through CFTB, SAGU was able to donate these used computers to help the visually challenged rather than disposing of them. “Through the Lions Club and SAGU’s IT department, we are able to help some people get something that they may not be able to afford or may not have the appropriate software in order to use it,” Walker said. The computers SAGU donated will be installed with the appropriate software to fit the specific needs of visually challenged individuals. The hard drives will be wiped clean and audio recognition or magnification software will be installed. After this process which usually takes approximately one to two weeks, the computers will then be sent to the appropriate recipients. “We are extremely grateful for companies that donate and generous organizations like SAGU and the Lions Club that give to our organization,” Jeppson said. Since its founding in 1995, CFTB has donated over 9,000 computers to the visually challenged throughout the nation. With an average of 80 to 100 computers donated each month, CFTB continues to experience growth and continue in its mission to provide opportunities for the visually challenged to utilize technology throughout the nation. Next articleEnd of the Road for Driver Responsibility Program?